Meet Donna Rothchild! Currently the Co-Service Unit Manager for the Edison/Metuchen/Highland Park Service Unit (among many other roles), Donna has been an adult Girl Scout for 11 years. She has done so much to impact her Girl Scout and local community, setting a great example of dedication and leadership to young Girl Scouts within her Service Unit. How long have you been in Girl Scouts (as a girl and/or as an adult)? I was involved with Girl Scout for 5 years as a girl. I have been an adult Girl Scout for 11 years. What ways have you volunteered in Girl Scouts? What has the most rewarding role been? I have been a Co-Service Unit Manager, Service Unit Manager, Service Unit Cookie Manager, and Gold & Silver Award Review Team member. The most rewarding role is definitely being a Service Unit Manager. I enjoy being part of everything it takes to run a Service Unit, and getting the chance to work with so many wonderful volunteers. In what ways has your Service Unit impacted your community? Our Service Unit has impacted our community in so many different ways. We have worked with St. Peter's Hospital, Ozanam Family Shelter, Hands of Hope Food Pantry, Bridges Outreach, The American Heart Association and many more to help make our Scouts aware of ways to give of themselves to make our world a better place. What was your favorite part about Girl Scouts as a girl? As a young Girl Scout, I loved earning badges. I still have memories of my best friend's mom teaching my troop how to sew. Why do you invest your time in Girl Scouting? I was raised to give back whenever possible. My goal for the time I spend in Girl Scouts is to help girls of all ages recognize and develop their strengths while helping those both near and far. As I watch the growth of the wonderful young women in our Service Unit, I know that along with the help of other volunteers, I am investing my time wisely. How do you feel volunteering with Girl Scouts has impacted your life? Volunteering with Girl Scouts has impacted my life in ways I never could have imagined. It has been, and continues to be a phenomenal learning experience, and allowed me to spend an incredible amount of time with my daughter. I have made friends I hope to have for a very long time, and learned lots of new things about myself along the way. I know it may be hard to believe with a Service Unit as large as ours (70+ troops), but I absolutely love being our Service Unit Cookie Manager. This year was my 9th year as SUCM ... that has to be some kind of record! Shelley R. Sylva earned her undergraduate degree in Religious Studies from the University of Virginia and her J.D. from Temple University School of Law. Shelley is a trained litigator who transitioned to public service early in her career. Shelley’s public service career began in the affordable housing industry where she worked at the fourth largest public housing authority in the United States. Shelley’s career at the Philadelphia Housing Authority (“PHA”) began in the legal department where she worked on lease enforcement and tenancy matters. She was also responsible for managing outside counsel who handled complex litigation matters on behalf of PHA. After two years in the legal department, Shelley developed a reputation for being a strategic thinker who could work across various businesses and was promoted to the Director of Quality Assurance. In that role she was required to identify compliance issues, determine solutions and provide executive leadership with the necessary recommendations to address any deficiencies that existed. She was promoted to PHA’s first Chief of Staff because of her superior organizational skills and communication skills. As Chief of Staff she organized and participated in all leadership team meetings and strategic planning initiatives. Shelley was responsible for building relationships within and outside of the organization. Finally, Shelley was promoted to Assistant Executive Director Administration (Chief Operations Officer), where all administrative units and their Executive reported to her including Human Resources, the Executive Office, Government Relations, IT and Communications. Shelley's operational abilities, regulatory expertise and analytical skills positioned her well to transition to the financial services industry. In June 2013 Shelley was recruited to join TD Bank, America's Most Convenient Bank to serve as their first Vice President, Senior Manager of Legal Operations and Governance. Shelley's mandate at TD is expansive and she is a key member of the General Counsel's team. At TD Shelley is responsible for the entire sphere of operations for the US Legal team that sits in 6 locations on the east coast. Shelley's ability to work across various business lines serves the Global Legal Department well as she has a reputation as someone who can get things done. During her time at TD Shelley has directly implemented several process improvements including automating all onboarding processes, streamlining the new business and product approval process and creation of a gap analysis protocol for new and changed laws that directly impact the operations of the legal department. Shelley has been able to cultivate her passion for Diversity and Inclusion at TD, and currently serves as a member of the Minority Leadership Subcommittee which steers and directs D & I initiatives throughout the US Bank. She co-chairs the Communications subcommittee for the MLS and serves on several Compliance, Legal, AML, D & I Committees. Most recently Shelley championed the "Count Me in Campaign" a bank wide campaign which encouraged employees to self-identify. In the first quarter of 2015 Shelley was a WOW award winner which is the highest quarterly recognition given to any bank employee. Meet Lisa Cole! Currently the Service Unit Manager for the Wihe'tonga Service Unit, Lisa has been a dedicated Girl Scout in her area for almost 10 years. She has co-led her daughter's multi-level troop, helped her Service Unit through a transition period, organized some great events, and more! Though only a Girl Scout for one year as a girl, Lisa took pride in wearing her uniform and enjoyed time spent with her troop. She continues to be passionate about Girl Scouting and the impact it has on girls, carrying these ideals through many aspects of her life! How long have you been in Girl Scouts (as a girl and as an adult)? I was a Cadette for 1 year. I became involved with my daughter’s troop 8 years ago and became a co-leader for her troop. What ways have you volunteered in Girl Scouts? I have volunteered as a co-leader of a multi-level troop. Our Service Unit team went through some transition 3 years ago and Julie Sinkoff was our acting Service Unit Manger. I volunteered to help her with registrations, recruiting and troop organizing until a new Service Unit team was in place. During that year our troop ran the 1st WOW Jr. event. I have been a part of the community camp committee for the past 4 years and last year I was the chair for that committee. I have served on the Service Unit team as troop organizer and recruiter, co-SUM and I am currently the Service Unit Manager. Unfortunately I was only able to experience Girl Scouts for 1 year as a girl. My favorite part was selling cookies! I also loved getting together with my troop and wearing my uniform. I invest my time into Girl Scouts because I love the fact that girls get to be part of a movement that provides resources, activities and experiences that are girl lead and help shape them into leaders. I love watching them set goals and achieve them. I love hearing them giggle in the next tent - even if it's in the middle of the night! I love watching them become friends and share experiences. Volunteering with Girl Scouts has helped me to become more confident in myself as a leader and has challenged me to step out of my comfort zone not just where Girl Scouts is concerned but in my personal and professional life. I have had the opportunity to meet and network with an awesome group of women and girls that I would never have met if it were not for Girl Scouts. I have learned so much from the leaders and especially the girls in my Service Unit as well as other volunteers in our council. They all help to fuel my passion for Girl Scouts even more! I enjoy working with the girls and having the responsibility of being a role model to them. I have been employed at Verizon Communications for 17 years as an Operations Clerk. Through the Verizon Foundation I am able to request a grant for $750.00 each year after logging at least 50 hours of volunteer time. This year our Service Unit is using the grant for community camp! Along with having a supportive employer, I am blessed with a husband and children that support me and share me with Girl Scouts! Young Diplomats is a residential summer program where high school students will reside on the Hampton University campus in Hampton, VAfor one week and they will be engaged in discussions with highly qualified teachers, Hampton University faculty and administrators, community leaders and political figures. Students will be challenged to think about the U.S. and Chinese relations and learn how to get involved in global affairs through the exploration of the United Nations’ Millennial Development Goals, as well as explore the Chinese language and culture, and more. Most importantly they will experience Chinese etiquette, a trip to the Laogai Museum in Washington, D.C. and recreational activity: sailing, tennis, horseback riding, and more! See below for more details. Learn Ballroom dancing, dining and social etiquette, recreation, trip to Washington D.C., and more! Spring is coming soon (perhaps not soon enough as today is cold and windy day!) 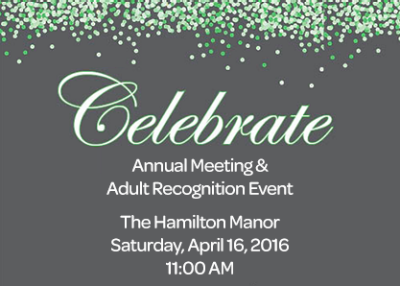 and when this time of year rolls around, our Council becomes focused on a highlight of our year – Celebrate!, our annual Council meeting and adult recognition event. This year’s event will recognize the amazing contributions of volunteers all across our Council. Volunteers are the engine of Girl Scouting, and without your commitment and dedication of time to our mission and girls, we would not be able to accomplish all that we do – and girls would not have the opportunities to learn, grow and succeed. I’m looking forward to seeing many of you at this year’s event! Recently, we had a unique opportunity to be part of change that’s needed so that girls can thrive. Last month, GSCSNJ joined with the American Association of University Women NJ Chapter, Assemblywoman Pam Lampitt (District #6), Congressman Donald Norcross (District #1) and other community leaders at a press conference to raise awareness about the issue of pay equity. Financial literacy is a core component of Girl Scouting, as the 5 basic skills girls learn through the cookie program teach foundational money management and business skill. As I said in my remarks that day, our success with girls is predicated upon the notion that the playing field is equal, and that girls will have equal opportunity to earn equal pay when they enter the workforce. Sadly, the statistics show us that this isn’t the case and that means the future of our girls is at risk. I believe it is our responsibility to shine a light on this issue to raise awareness and to show girls that speaking on issues can start a ball rolling to make meaningful change. Isn’t that what Girl Scouting is all about isn’t it? Our volunteers help girls discover the gifts, talents and interests that make them special. As adults, we show girls by our example how to lead; how to make choices that honor our individual values, beliefs and goals while at the same time respecting those of others; how to advocate for our ideas and passions while being a sister to every Girl Scout; and how to take action to make our communities better. And, we show them how learning can be fun – through the variety of activities and adventures Girl Scouting provides. It’s truly an honor to work with so many dedicated volunteers. On behalf of all the girls of our Council, thank you!